As of 1:18 pm ET today (April 1st), BITCOIN is attempting to hold above the upper edge of its downtrending channel, while continuing its slide lower, as shown on the daily chart below. 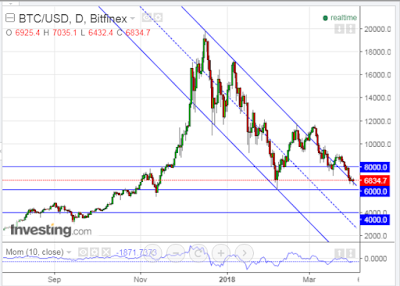 Previous attempts to hold above the channel have failed and the momentum indicator has continued to remain in downtrend in bearish territory well below the zero level. Near-term support sits at 6000. Failure to hold above that level could see price drop to 4000, or lower.